1. Begin by making your dashi: Combine kombu, mushrooms and water in a small saucepot. Soak, without any heat, for an hour. After an hour, gently raise heat but do not bring it to a full boil. When the kombu floats, remove it. Now bring the dashi to a full boil for 2 minutes. Remove from heat. Remove the shiitake mushrooms. This dashi should be used the same day it is prepared. 2. 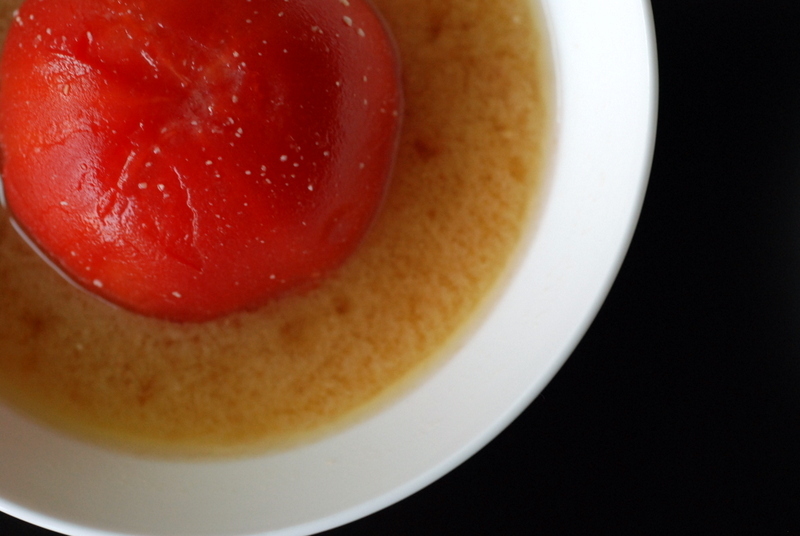 While the dashi is being made, make a small x with a sharp knife on the bottom of the tomatoes. Blanch the tomatoes in boiling water and peel off the skin once cooled. 3. Meanwhile make your pesto: Combine the cilantro, mint, pine nuts, lime juice + zest, garlic, salt and oil in a blender and blend until smooth. 4. 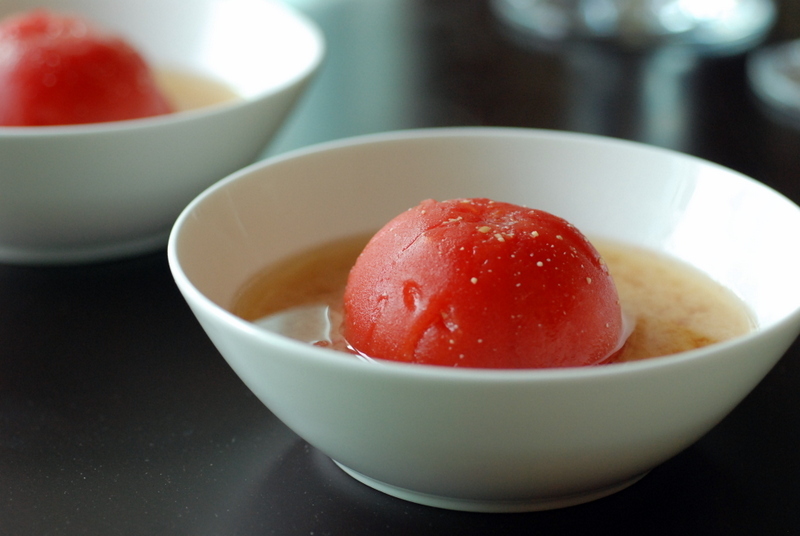 Put the tomatoes in a saucepan with the dashi stock and warm over a gentle medium heat. Remove 2-3 tbsp of the dashi and combine it with the miso in a small cup. Use the back of your spoon to dissolve the miso in the broth. Stir the miso mixture into the main soup. Raise the heat and once it just reaches a boil, immediately turn off the heat. Place a tomato into the centre of each soup bowl and ladle the soup around it. The soup will only go up partway. Place a small dab of the pesto on top and serve. I’m sorry you got the crud! Vegas and I had it for two weeks and I still have a cough. Hope you’re feeling better! And I agree on the podcasts thing. I always wondered how/when people listened. Wish I’d though of this a couple of weeks ago! ah. the soup sounds totally healing and delicious. sorry to hear you were sick. the flu is the worst! and you know something weird about the flu vaccine, at least in my experience? : the only time i’ve ever had the flu (and it was the worst sickness i’ve ever had) was the year i got a flu shot. i’ve never been susceptible otherwise. i guess i’m a beast or something. but yeah, i’ll never get a flu shot again. and re: podcasts, i keep hearing about this serial podcast and some others. i’ve listened to one called drabblecast before — dramatic readings of short fiction accompanied by music and sound effects. kinda cool! I never listen to podcasts.. and have always wondering the same thing. When?? I’m not sure if it’s just me, but I’m way more likely to read an article online than to listen to something. Maybe it’s the fact that I can skim through/skip parts and it’s difficult to do that during a podcast. I love podcasts! I haven’t gotten into Serial (although I probably should) but I like tons: StarTalk, Stuff Mom Never Told You, The Sporkful, Freakonomics, Invisibilia, Stuff You Should Know, The Nerdist, The Splendid Table, The Moth and Spilled Milk. I have more on my list, but haven’t gotten around to listening to them yet! This soup is just gorgeous with the whole tomato in bowl–so elegant.